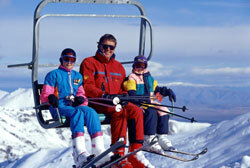 Mt Dobson Ski Area, Skiing, Snowboarding and family fun - Lake Tekapo. Activites with Tekapo Tourism. Located on a southern face of the Two Thumb mountain range is the Mt Dobson Ski Area. With 400 hectares of accessible terrain, Mt Dobson caters for the learner right through to the expert. Mt Dobson's car park is the highest in New Zealand at 1725m (5500ft) and can provide parking for 200 vehicles. Four lifts operate in the basin. The new triple chairlift services the west valley, a T-bar on the main slope. The platter lift services the longest learners slope in New Zealand and a learners rope tow services the beginners area. 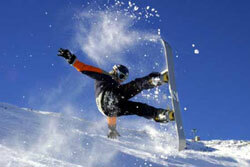 Eight qualified instructors operate the ski school and cater for skiers and snowboarders of all ages. 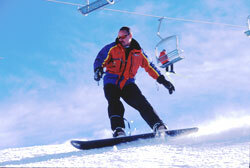 Mt Dobson has snow making facilities and over 300 sets of hire ski packages and 50 snowboards. A limited quantity of clothing is also available for hire.